At one time in the not too distant past, FNB Stadium was a somewhat bland soccer facility lost in the Seweto sprawl and known only to the rest of the world as the site of Nelson Mandela's first speech in Johannesburg after his historic release from prison. And so the dusty stadium would have remained, but when South Africa was awarded the 2010 FIFA World Cup, an extensive make-over was in order. Indeed, even the name would change as the outdated FNB Stadium received a complete make-over to the tune of 1.5 billion rand. For the lion's share of June and July, the 94,000 seats of the newly-named Soccer City Stadium will be a vibrant flood of patriotic colors amid the hum of swirling vuvuzela horns. 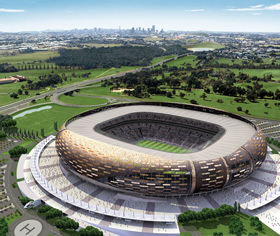 At the center of the action is the striking exterior of the refurbished stadium – designed to have the appearance of an African pot; the cladding on the outside is a mosaic of fire and earthen colors with a ring of lights running around the bottom of the structure, simulating fire underneath the pot. An important component of the ground-breaking make-over of FNB Stadium included the installation of a Reliable Controls MACH-System™ by our South African Authorized Dealer, Redbase Systems. With a mixture of environments and large-scale needs, Soccer City Stadium was loaded with an impressive list of conditioning equipment that includes 347 water source heat pumps, 134 fans, 14 air handler units, and four computer room units. The main plant room was populated with four cooling towers, and four secondary condenser water pumps controlled on differential pressure. Desmond Cory, a member of Redbase Systems, describes the MACH-Global™ as the workhorse of the installation, "We have two fully-loaded MACH-Global™ controllers. We are using the two subnetworks on the one MACH-Global™ controller to pick up the MACH2™, MACH1™, and MACH-Zone™ controllers." The entire installation is BACnet® which allows for integration into a third-party's electrical power controls system. Congratulations to Desmond Cory and his team for a winning job on the world stage.